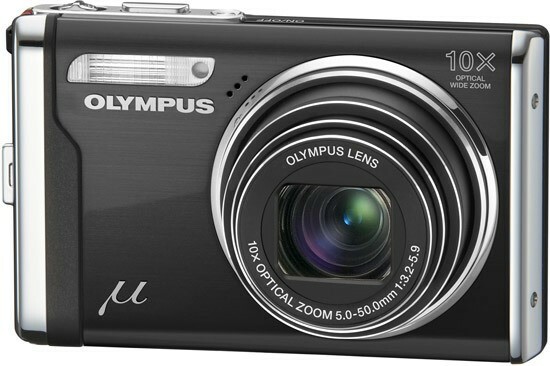 The Olympus mju 9000 camera quite easily fits in the palm of my medium sized man's hands. One of the mju 9000's main advantages is that it's both a little lighter and smaller than its main competitors, the Panasonic Lumix SX200 IS and Canon PowerShot SX200 IS, especially in width, although there's only 5mm or so difference between them. Olympus have still somehow squeezed in a 10x zoom lens, equivalent to a focal range 28-280mm on a 35mm camera, which provides a focal range that should cover almost every photographic situation that you'll encounter. It's not quite as versatile as the TZ7's 25-300mm or the SX200 IS's 28-336mm lens though, and it does extend quite a long way when zoomed to full telephoto. The lens' maximum aperture is a fast f/3.2 at wide angle but a rather slow f/5.9 at full telephoto. Taking hand held photos, especially in the longer half of the zoom range, carries the risk of your photos being ruined by camera shake. This is where image stabilisation comes to the rescue. Olympus markets the mju 9000 as having “Dual Image Stabilisation", a mechanical and digital system, but the latter simply boosts the ISO sensitivity to avoid having to use longer shutter speeds, so it's the former that really counts. The mju 9000, just like its immediate predecessors, counteracts camera shake by shifting the sensor in the opposite direction. Image stabilisation can only be activated from the menu, and is turned on by default. When set to On, image stabilisation kicks in whenever you depress the shutter release halfway, giving a faint, continuous sound. The live view on the LCD or EVF shows the stabilisation effect - the image appears to be floating in an almost surreal way. With image stabilisation, you can use about two times longer exposure times to take blur-free hand held shots than without it. The Olympus mju 9000 is a very well-built camera with a high quality metal body, with our review sample finished in an attractive metallic blue with silver accents. The design is dominated by the 10x lens on the front and the 2.7 inch LCD screen on the rear. There is no optical viewfinder, which follows a recent trend in digital cameras, and this does make the camera a little harder to keep steady at the telephoto end of the zoom. The hand-grip on the mju 9000 is unfortunately of the almost non-existent variety which doesn't make it particularly easy to hold, although there is a plastic, textured thumb-rest on the rear next to the small mode dial. On top of the camera body are the On/Off button, shutter release and zoom lever. The large shutter release is in a natural location for your index finger, with the zoom lever positioned to the right. I found that this push-pull lever had a rather "spongy" feel that didn't inspire too much confidence. Everything feels generally well built and substantial, with only the zoom lever feeling a little out of place. The camera comes with a printed quick start guide and a fairly well cross-referenced PDF manual on disk. Not really much use though if you're out taking pictures and need to find out what a particular option does. The mju 9000 is powered by a 3.7V / 880mAh lithium-ion battery. The battery compartment door is located on the bottom plate and has a plastic lock - note that the battery can be easily inserted the wrong way round. The memory card slot is also located here. The Olympus mju 9000 accepts xD-picture and microSD cards (more commonly used in camera phones). This is a problem in so much as xD cards are slower and more expensive than the more popular SD cards, and fewer external card readers have a slot for them. In an emergency, you can save about 7 full-resolution shots in the mju 9000's 45MBs of internal memory. Next to the battery / memory card compartment is the tripod socket, which is unfortunately made of plastic but is at least aligned with the middle of the camera body. Moving to the right hand side, as viewed from the back, you'll find a small plastic flap protecting the DC In / USB/AV Out port, and below an eyelet for attaching the supplied wrist strap. The rear of the camera is dominated by the 2.7 inch monitor, which has an acceptable resolution of 230k dots. It has an admirably wide viewing angle, and is fairly usable outdoors too, something that cannot be said of all LCD screens. Importantly, the display can show you overlaid shooting information if you so desire, and this includes Rule of Thirds gridlines and a live histogram too - albeit not both at the same time, which is a shame. To the right of the LCD is the ubiquitous four-way controller with buttons that provide direct access to exposure compensation, two macro modes, self-timer and flash modes. In the middle is the OK/FUNC button which is used to call up a L-shaped sub-menu containing 6 frequently used options, a system that's incredibly similar to the one used by Canon's compact camera range. The Olympus mju 9000 has a comprehensive range of shooting modes, accessed from the small shooting mode dial on the rear. There is a fully automatic mode, marked iAUTO on the mode dial, for those with absolutely zero photographic experience. In this mode you just zoom, focus and shoot without having to fiddle with the settings, which are all being taken care of by the camera. Intelligent Auto is a bit more sophisticated than the usual Auto modes, detecting the five most commonly used scenes and adjusting the camera settings, focus and exposure automatically. Being limited to only 5 scenes, it's certainly not foolproof though, so if you want tot take a little more control, turn the mode dial to the SCN setting and choose from the 14 scene modes available. None of these require you to know anything about f-stops, shutter speeds, white balance or depth of field - all you have to do is tell the camera what type of scene you are planning to take a picture of by picking the appropriate scene mode. The mju 9000's new BEAUTY setting automatically smoothes people's skin, useful for giving your friends and family the Hollywood treatment. It automatically detects faces in the picture, then shows a side-by-side comparison of before and after the effect has been applied, before finally recording the slightly softened and more flattering image (the whole process takes about 10 seconds). The Beauty Fix playback option lets you apply 3 different effects (Clear Skin, Sparkle Eye and Dramatic Eye) separately or apply them all in one go, so its a better idea to beautify your subjects at this stage. The Movie setting allows you to specify the resolution (VGA or QVGA), the frame rate (30 or 15fps), set digital image stabilisation on or off, and whether you want to take a silent clip or one with sound. In the first case, you may use the optical zoom and sensor-shift image stabilisation, but you can't if you choose to record sound. Exposure compensation, white balance and metering mode are available in movie mode too. Depending on the type of xD Card that you use, there are various restrictions on the length of movies. The options when using an xD M, M+ or H card are 640x480 at 30 fps or 15fps and 320x240 at 30fps, with a maximum file size of 2GB. If you're only using a xD standard card, the limit is reduced to a mere 10 seconds at 30fps. Finally, there is a Playback mode marked on the dial, which is a little unnecessary given that there is also a dedicated Playback button just below it! SAT, or Shadow Adjustment Technology, is similar to Sigma's Fill Light, HP's Digital Flash / Adaptive Lighting, Sony's DRO and Nikon's D-lighting. It lifts the shadows in an image without affecting the midtones or the highlights. This mode is accessed by the OR button underneath the navigation pad (you can also access the panorama and multi window options here). Since the best uses of this technology are in landscapes, cityscapes and streetscapes, when you can't control the light and the shadowed areas may be too big or too far away to be filled in with flash, I was utterly puzzled to learn the only AF mode available with SAT turned on is Face Detect. Another surprise came when, upon reading the relevant section in the manual, I found out Olympus recommended using this technology when shooting portraits against a bright background. What? That's one occasion when you DON'T need it - just set the ambient exposure for the background and use the flash to illuminate your subject's face. Note that the task of opening the shadows in a contrasty photo can also be performed post capture, under the Lighting Fix option of the Perfect Fix menu in playback mode, but the results are less than perfect. The mju 9000 has a couple of continuous drive modes, accessible via the main menu. Full-resolution shots can be captured at a rather pedestrian 1fps, but the camera also offers a faster 5fps Hi1 mode at 3 megapixels. This sounds a lot more exciting, but the quality is not what you'd expect, even when you consider the reduced pixel count. This is not just because the camera automatically increases the sensitivity to ISO 400. Apparently what happens is that the mju 9000 takes a video at the specified frame rates, then takes the individual frames and blows them up to 3 megapixels. The resulting images don't print well except in the smallest paper sizes, so you'd better use the faster drive mode when shooting for the Web. There are a variety of auto-focusing modes on offer, including Face Detect, iESP, and Spot. Face Detect AF tries to find a face in the frame and if it succeeds, locks on to it. In iESP mode the camera uses several AF points and picks one of them at its own will. Spot AF is what most people would recognise as centre-point AF. 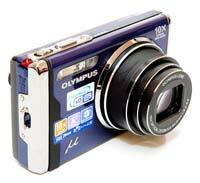 The start-up time from turning the Olympus mju 9000 on to being ready to take a photo is quick at around 2 seconds. Zooming from the widest focal length to the longest is a little slower at around 3 seconds. Focusing is quick in good light and the camera achieves focus most of the time, and the lack of a focus-assist lamp doesn't deter the mju 9000 from locking onto the subject even at the tele-photo end of the lens in fairly low-light situations. It takes about 1 second to store an image, allowing you to keep shooting as they are being recorded onto the memory card - there is a very brief LCD blackout between each image. Once you have captured a photo, the Olympus mju 9000 has a good range of options when it comes to playing, reviewing and managing your images. You can instantly scroll through the images that you have taken, view up to 25 thumbnails, zoom in and out to check sharpness, lock, rotate, erase, add a four second sound clip, set the print order, and view a slideshow of still images, movies or all. The Perfect Fix menu allows you to apply Shadow Adjustment or Redeye Fix to any photo that you've already taken, and the Beauty Fix option lets you apply 3 different effects as discussed above. The Display button toggles detailed settings information about each picture on and off, such as the ISO rating and white balance, and there is a small histogram available during playback which is helpful in evaluating the exposure. In summary the Olympus mju 9000 is a well-made, intuitive and fairly compact point-and-shoot camera with the obvious main attraction of that 10x, wide-angle lens. There are few real innovations on offer, but also few nasty surprises or faults.